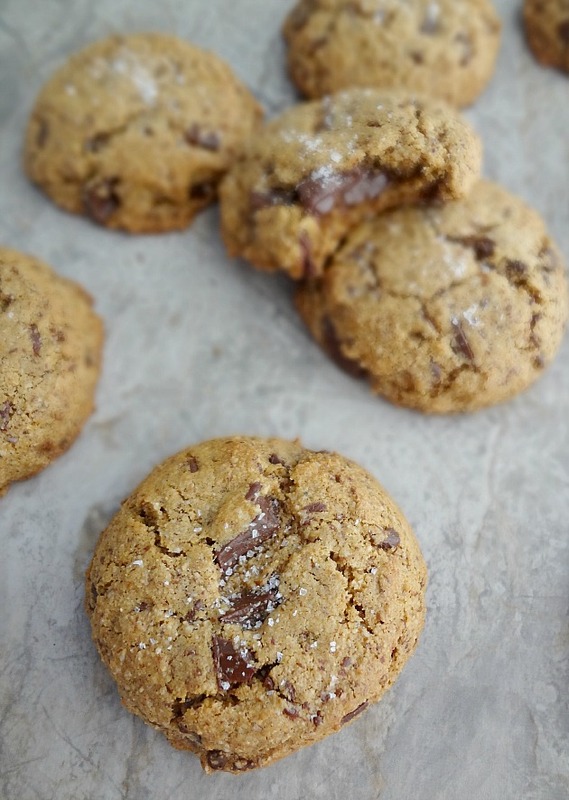 When I saw Ambitious Kitchen share these cookies...I had no intention on making them anytime soon. But then How Sweet It Is raved about them. And I realized I had all the ingredients on hand. So I made the best decision ever and decided to give them a try. 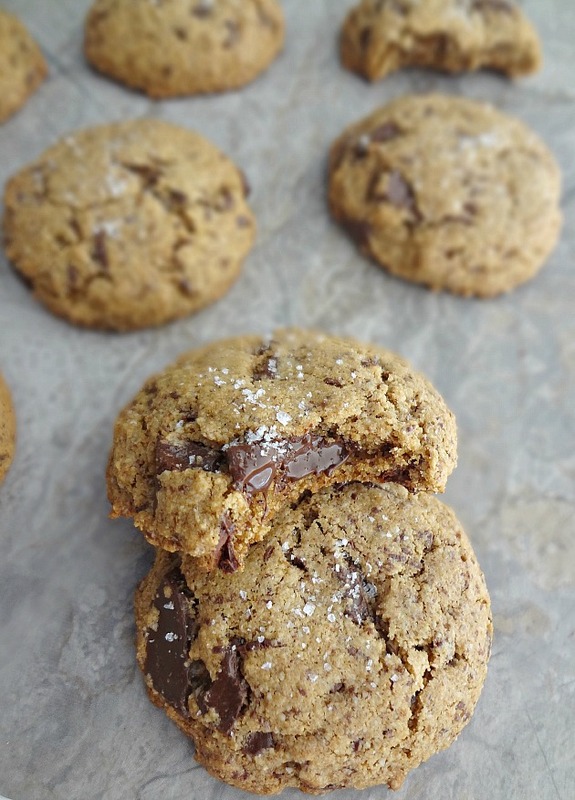 And they're one of my all-time favorite healthier cookie recipes. Michael's really becoming a cookie connoisseur, I'm a little proud of it. I like to think I'm responsible. I decided not to tell him there was anything different about these cookies but he immediately was like "Hmm...they're a little nutty. 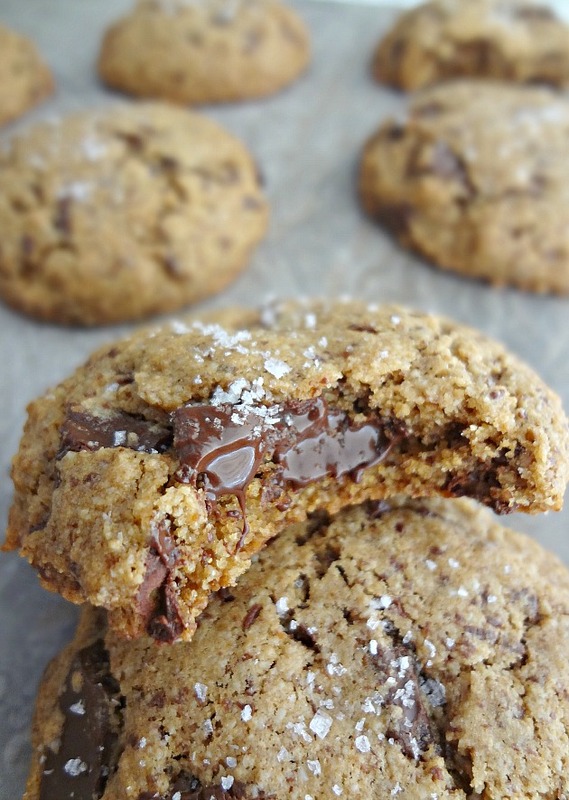 The texture is different too-is there almond butter in these?" And I mean...almond flour...he wasn't too far off. I then came clean and he just shrugged and ate the rest of the cookie happily. Ahh how far we've come. That reminds me of a funny story-we were voting early for the upcoming primary and I was apparently just out of sorts that day because I kept asking questions and then seeing there were very obvious answers around me. And Michael kept teasing me every time. The people at the election office were getting a kick out of it and the one older woman asked if I was sure about him. I then informed her we were married so I'm fairly stuck with him. She giggled and said well a sense of humor is always good for a long lasting relationship. I agreed. And then glared at my oh so funny husband. They're chewy. Just a little bit nutty (part of why I'm so impressed Michael picked up on it). 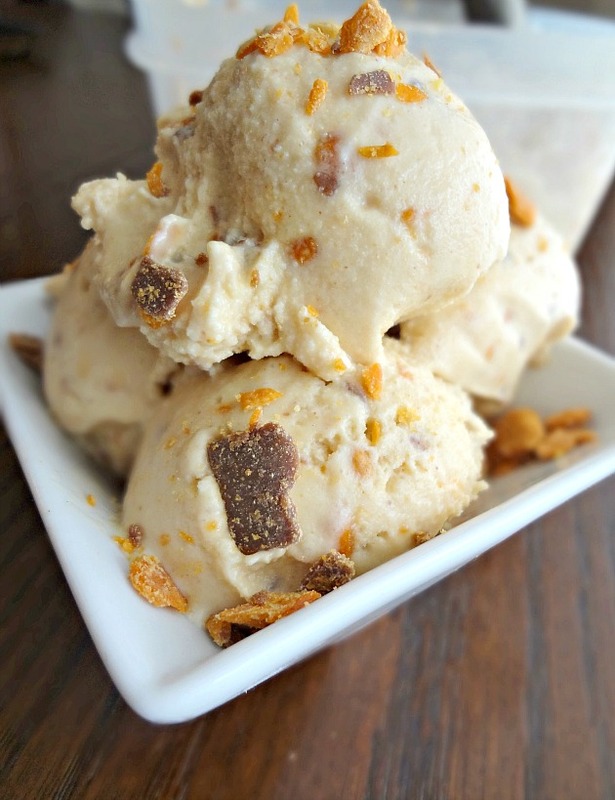 The coconut sugar gives them a deliciously complex and almost caramelized flavor. 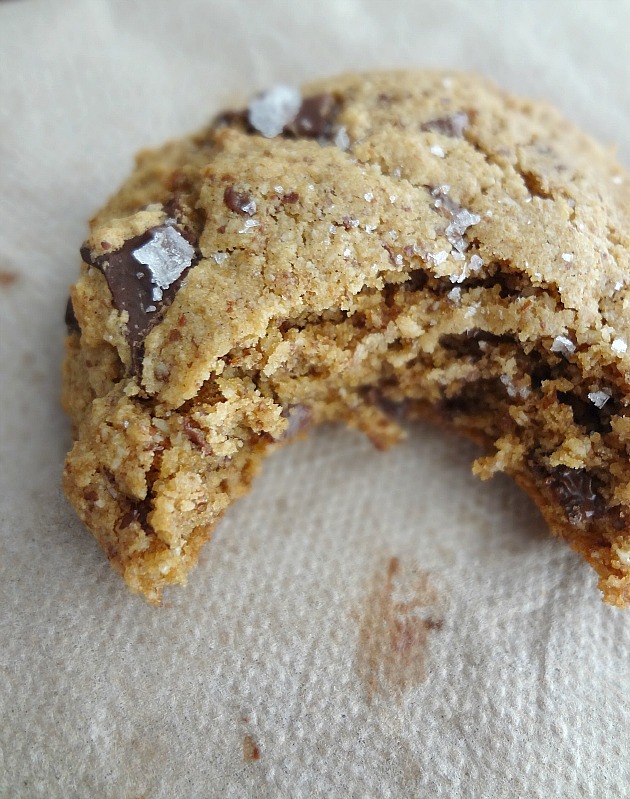 Gooey dark chocolate chunks are the things I dream of...and sea salt on top because I firmly feel all ccc's need it. My cookie jar was a happy place when these resided there. And they couldn't be easier to make-you just mix them up in a bowl, you don't even need an electric mixer! 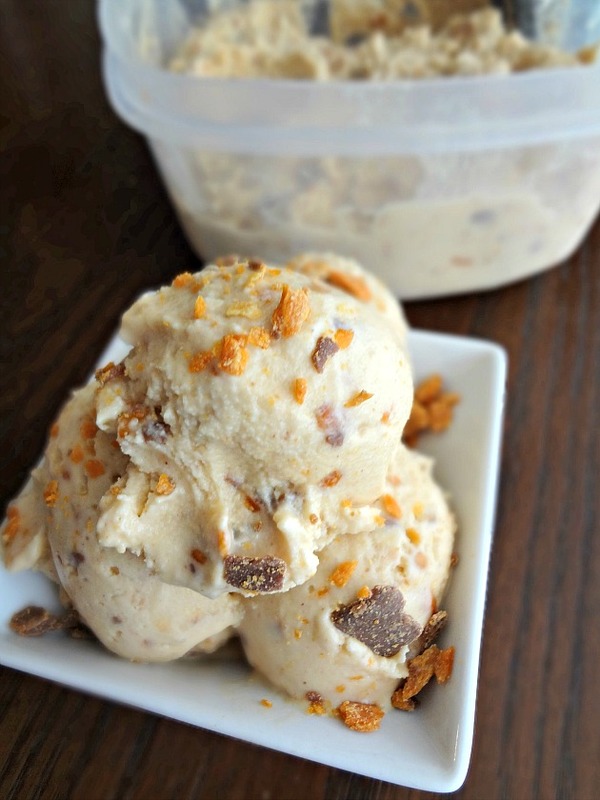 And there's no chilling required soo...you can pretty much have cookies in your belly in less than 30 minutes. SCORE! We're going to do something new around here! Myself and some other food bloggers are going to bring you a meal plan with delicious options for the coming week. Fun, right?! I'm so excited to start and I hope you all enjoy these delicious meal ideas. Let's talk about my trip to San Antonio for my brother's airforce graduation! Thursday we caught our first glimpse of him during the "Airman's Run" (although mom wasn't able to see him but I did!) and then there was an Honor Graduate Ceremony (the top 10% of their class get to be honor grads, and Josh was one! He actually finished #2 in the entire class!) and then a Coin Ceremony (they get coins which are like a thing...anyway) and theeen we got to go hug him! And we hung out with him around the base the rest of the day, and it was awesome. Friday morning Josh's best friend (and our across-the-street neighbor most of our lives) Bryan came and we watched the official graduation ceremony--which mostly just involved them marching and stuff. Then we got to go hug him again (yay :D) and then their dorms had an open house so we got to see where he slept and his locker and we met his MTI's (training instructors). --it was also pretty hilarious because Bryan is an officer (he's almost done training to be a fighter pilot) and Josh's fave MTI called the entire dorm to attention to pay respect to him and he was so embarrassed and then she said, "You look a bit red there, Sir." and it was sooo funny. Anyway, then Bryan had to go back to his base and we were going to meet him there after we grabbed lunch. THEN we went to Sea World (even though I'm sort of boycotting them because of the documentary BlackFish--but we all got in for free because of Josh being in the military). It was fun, though-especially the rollercoasters. Then we had just enough time to grab some dinner at Taco Cabana (which was pretty good for fast food!!) before getting the boys back to their dorm. Sunday was our last day and we were all pretty tired so the three of us (my mom, Josh, and I) just hung out and spent time together on base and in mine and mom's hotel room. And then way too soon we had to say goodbye. I had the best time but I miss my brother like crazy. *sigh* Also I wish Michael could have been there, he would have loved the food and the River Walk (and, of course, seeing Josh). Then I got home and it snowed. And Michael's car ignition broke (which we got fixed and it was fine but it was an annoying few days). And this weekend I'm working. Blech. But this is for all my fellow Jess+Rory shippers. Hiii everyone! I'm back!! Didja miss me? I missed you! I have to say, though, I had THE BEST time! It was so wonderful to see my brother and spend so much time with him. We also got to check out San Antonio-which is an awesome city and I cannot recommend the River Walk down there enough! So beautiful and so many amazing restaurants! We did a lot of fun stuff, and I'll talk more about it on Saturday, but yeah the best part was definitely my baby brother. It was so hard to leave him and know I won't see him for another 6ish months (after he's done with his tech training for his intel job in the airforce). But at least I can send him care packages now! I know he misses his sissy's food lol. I would put roasted garlic in everything if I could. So I obviously jumped at the chance to put it in gravy! 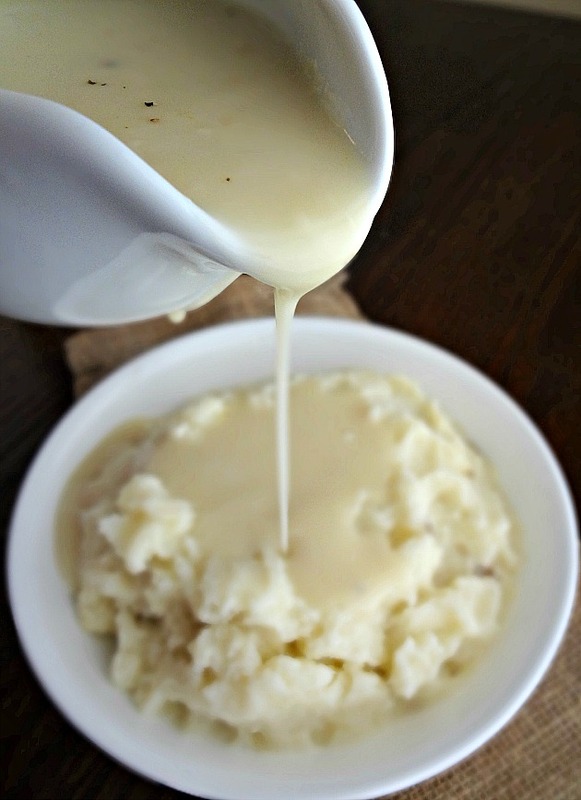 Now...I get that gravy season is sorta technically over. But like...is it? Is it ever really over. I think not. But...yeah you might not be making turkey and might not have drippings. I certainly didn't when I made this. Sooo I've included a way to make this both with and without drippings. Huzzah! 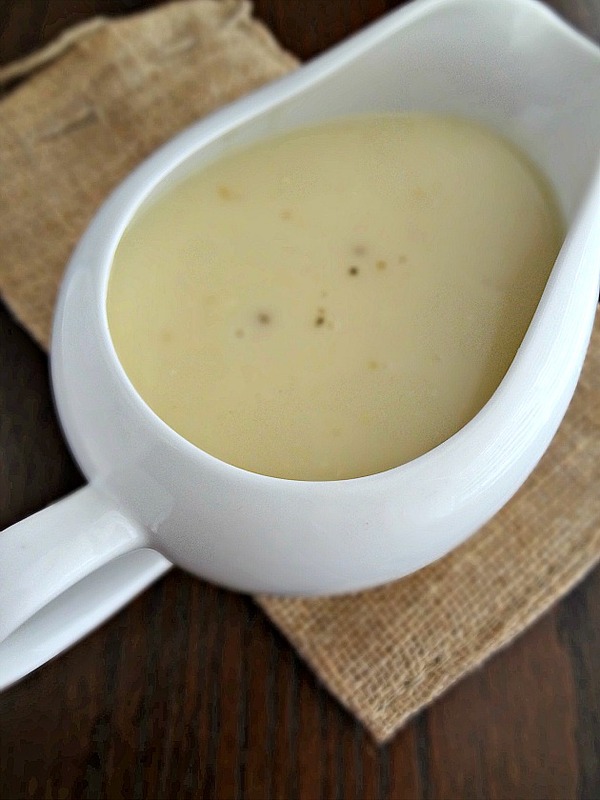 This gravy is rich and creamy and has a delicious mellow garlic flavor and seriously takes any mashed potato recipe over the top. A must make, in my humble opinion. Excuse the messiness of these photos. 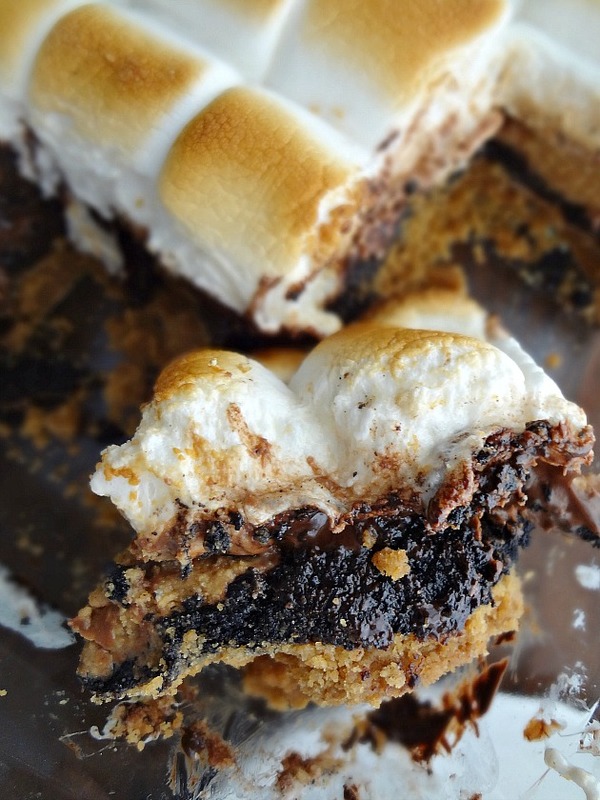 I'm just trying to show real life here...I mean...s'mores and melty peanut butter cups are messy. Any of you who have children (or remember being children) should be plenty aware of this fact. All things considered I think I did the best that could have been expected. Plus....I mean....messy and gooey looks kinda yummy, ya know? Now...before I get into the transcendent experience that is eating one of these brownies...I need to give you guys a heads up! I'm going to be out in Texas Wednesday-Monday to go to my brother's graduation from basic training for the airforce. Sooo I'm not going to be able to post this Wednesday or next Monday. I KNOW-I'm sorry! But I figured...at least I'm leaving you with something completely over the top amazing to keep you all satisfied until I get back. So, hopefully these brownies will help me earn your forgiveness. I mean-look at these photos. We're cool. When I made these delicious brownies I instagrammed them. And was told by one of my husband's coworkers that she needed one. And I thought to myself "These are really rich, and this did make a huge pan of brownies...I could probably share." So I told her I'd send some in with Michael the next day. And apparently she told everyone because I shortly thereafter got a text from him saying, "So I guess I'm bringing dessert tomorrow?" They were excited :D And I sent the brownies. And they were devoured. But poor Jess (the original coworker who commented) wasn't there the rest of the week and got no brownies! So she's been pouty about it. I can't really blame her. These are DARNED GOOD. Allow me to e'splain to you these magical brownies. 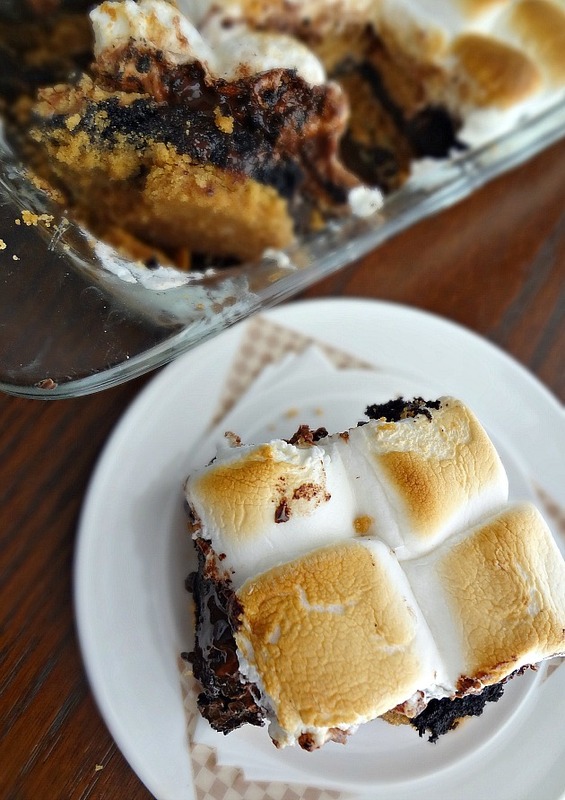 They have a thick and buttery graham cracker crust. Nomnom. Then they have a very dense and very chocolate brownie layer. Mmmhmm. 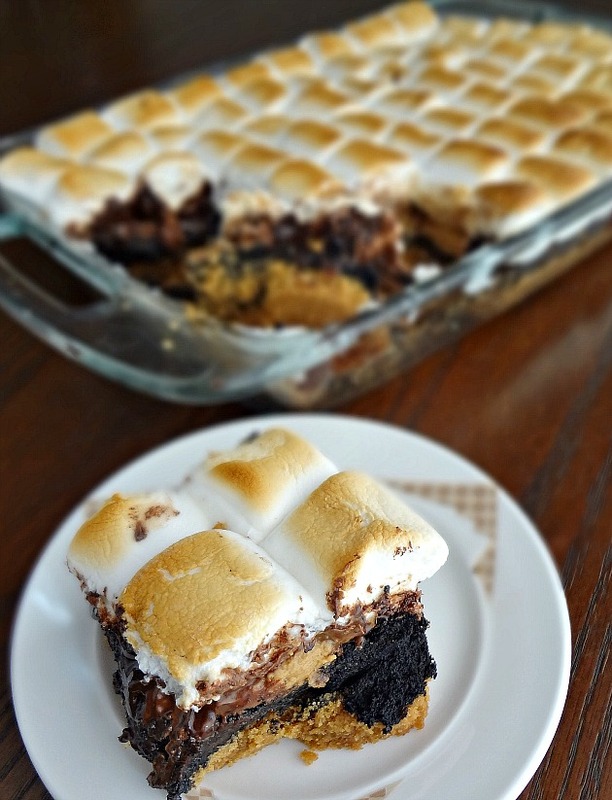 THEN they have peanut butter cups and melty dark chocolate barks layered on top of that. OMIGOSH. 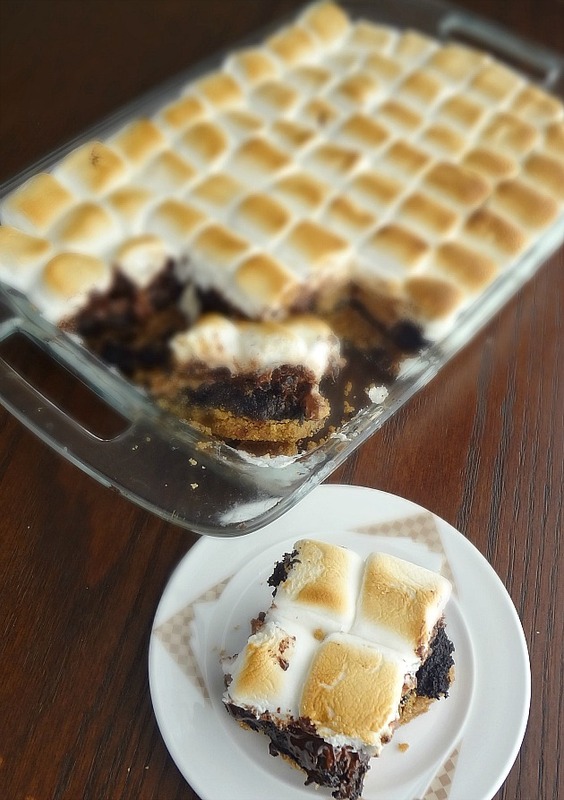 And theeen there are toasted marshmallows on top. YESYESFORREALSIESYES. In summation-these are insanely gooey and decadent and rich and pretty much what dreams are made of. You need them. I need them. We all need them. Another boring work-work-work week. It's also been super snowy here (boo)--is it snowy where you are?? Yesterday was great though-I went to a bridal shower for Michael's cousin and then he and I celebrated Valentine's Day by going out to dinner at one of our favorite places, Burntwood Tavern, and then we watched Supernatural and some movies. AND, as a special treat, he surprised me with a red rose when I got home from the shower :) Today I'm just working, bleh. What are your V-Day plans? Slight warning--this coming Wednesday I am going to Texas for my brother's airforce basic training graduation sooo I'm not going to be posting while I am gone (which is Wednesday-Monday). But then I'll be back in action on that Wednesday! Yay! OMG I AM DYING OVER THE FULLER HOUSE TRAILER! I'm already shipping DJ&Steve again lol. What’s Galentine’s Day? Oh, it’s only the best day of the year. Every February 13th, Leslie Knope and her lady friends leave their husbands and their boyfriends at home and just kick it breakfast style. Ladies celebrating ladies. It’s like Lilith Fair, minus the angst. Plus, frittatas! A few months ago Michael and I binge-watched Parks and Recreation. And we will never be the same-WE LOVED IT SO MUCH! So this year Galentine's Day really means something to me, because I love Leslie. And Ann Perkins. And April. And Donna. And the entire gang. Just like I love my food blogger gal pals, which is why we came together to celebrate this day of sisterhood and breakfast food! A big THANK YOU to Neighborfood and Gotta Get Baked for putting this thing together! Waffles are Leslie Knope's absolute favorite, so I considered sharing some. But-I've already shared A TON of waffle recipes, and I've found my favorite waffle recipes. 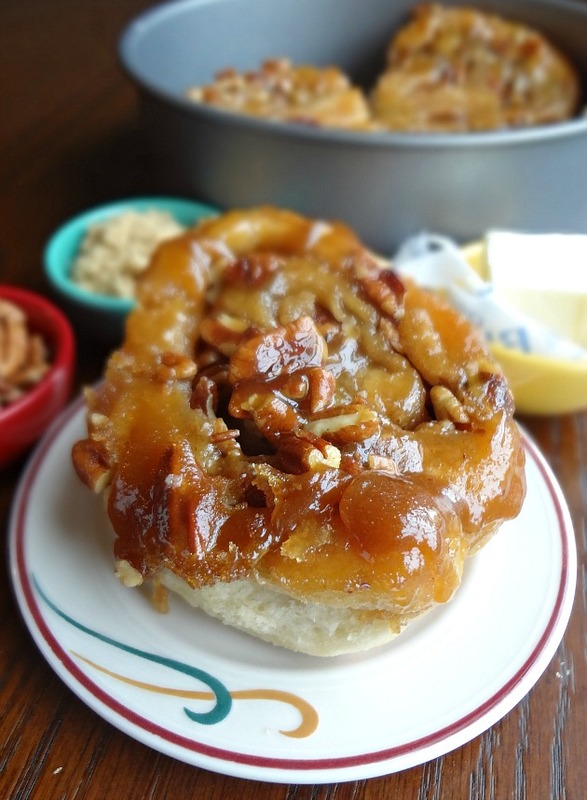 So I'm mixing it up with another breakfast treat that I know the Knope-ster would also dig: Pecan Sticky Buns! That are completely homemade, but pretty simple to make, and it only makes 4. Which is good because I, unlike Leslie, do not have triplets or a million friends and these are really best served fresh soooo 4 was plenty to split between Michael and I. But you can totally double the recipe if you need to! 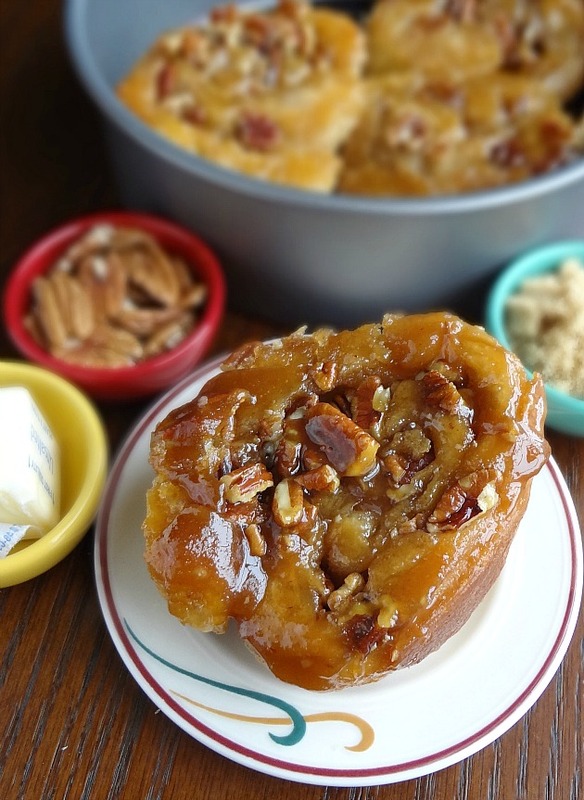 These sticky buns are chewy and fluffy and smothered in a caramel-pecan mixture that it cooks in and is stuffed with. Nothing makes your mouth happy like something sweet and rich and nutty in the morning, or at least that's how I feel! Michael's response upon taking a bite was "mmmmmmm"...so ya know...even the fellas support these. But today isn't about the fellas it's about the ladiiies! I have so many wonderful girlfriends thanks to this blogging community I'm a part of, and I'm lucky enough to have had the same exact best friend my whole life (my bestie Alex). I don't have a lot of friends but the ones I do have I really care about and nothing sounds better than being able to actually meet up with all my ladies for brunch. 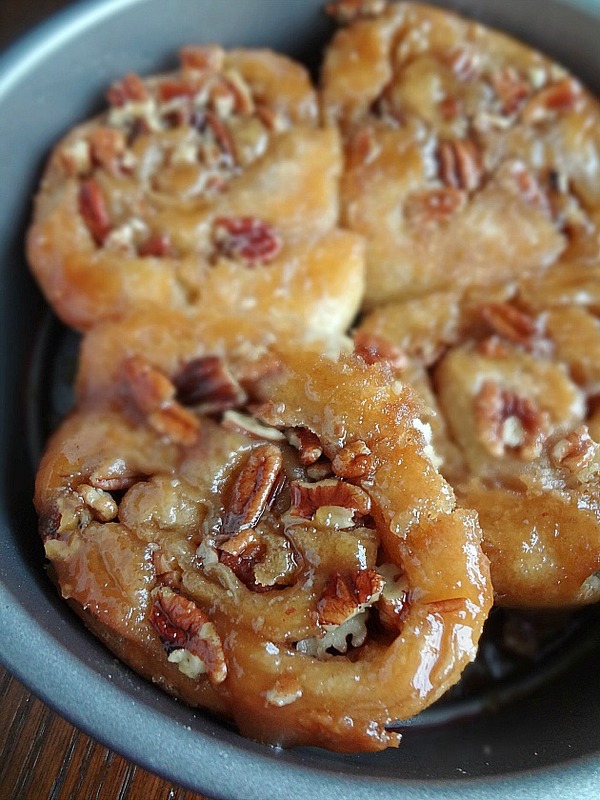 And bringing these sticky buns to the party. And then watching an old movie. That's the dream. Check out the rest of the Galentines Day Party deliciousness! I love popovers. They're kinda tough to describe but they're all light and fluffy inside and crisp and almost fried on the outside....they're sort of like a roll/donut hybrid? Sort of? 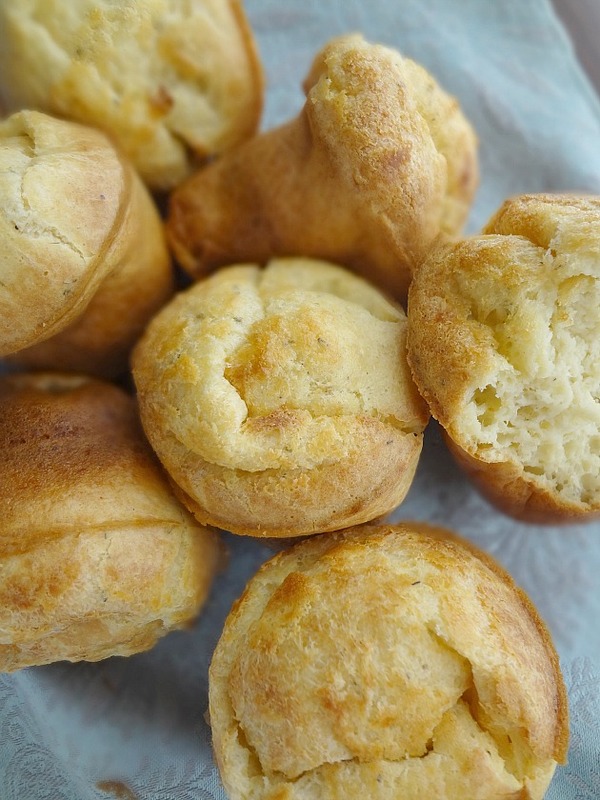 Thus far I have 2 favorite popover recipes that I've made-classic popovers and cinnamon sugar popovers. 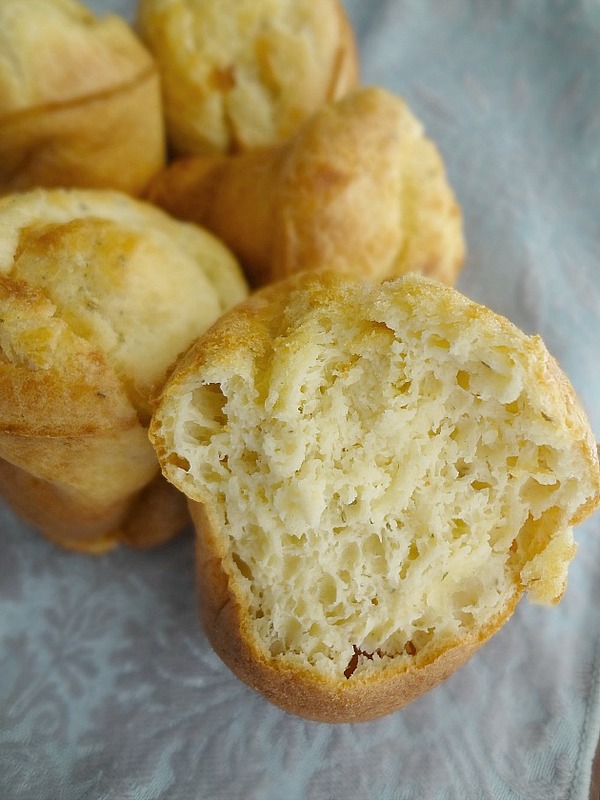 Today I mixed things up by making SAVORY popovers! ....truthfully...I'm reluctant to call these popovers. Their texture is a bit different and they are a WHOLE LOT eggier. They do rise up and look pretty like popovers, though. 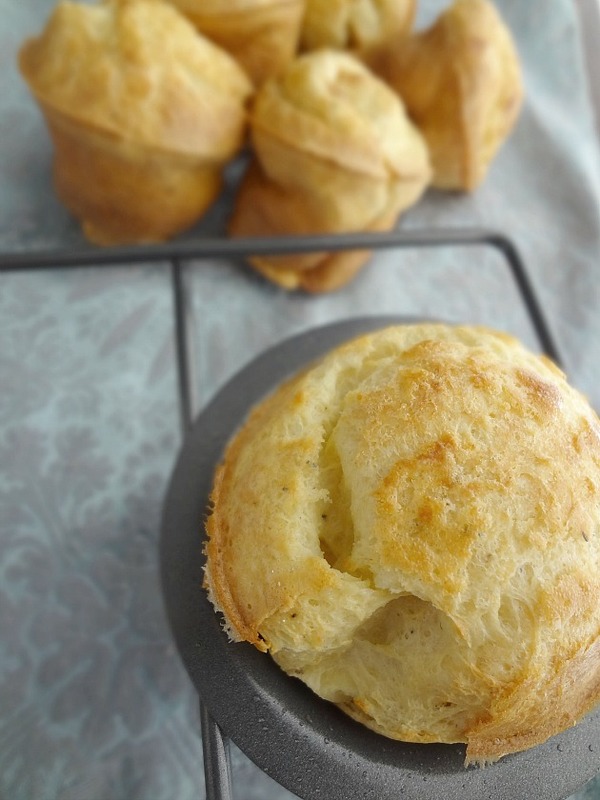 Now...as you may know...I'm not a fan of eggs (I mean I obviously bake with them but I don't like just eggs, not a fan of the taste) so I didn't end up being totally in love with these parmesan popovers. I realize this is a weird thing to say as I'm sharing the recipe but...we're honest here, people. It's how we do. And anyway...I'm a picky weirdo. Just because I didn't love something doesn't mean you won't! They're beautifully chewy-look at those pretty air pockets! They're also very subtly flavored with Parmesan cheese and herbs, nothing overwhelming, just the right amount. They would be a fantastic alternative to rolls to serve with your dinner (Especially with pot roast or roast chicken). I've discussed my deep and abiding love for lava cake before. It's one of my absolute favorite desserts. 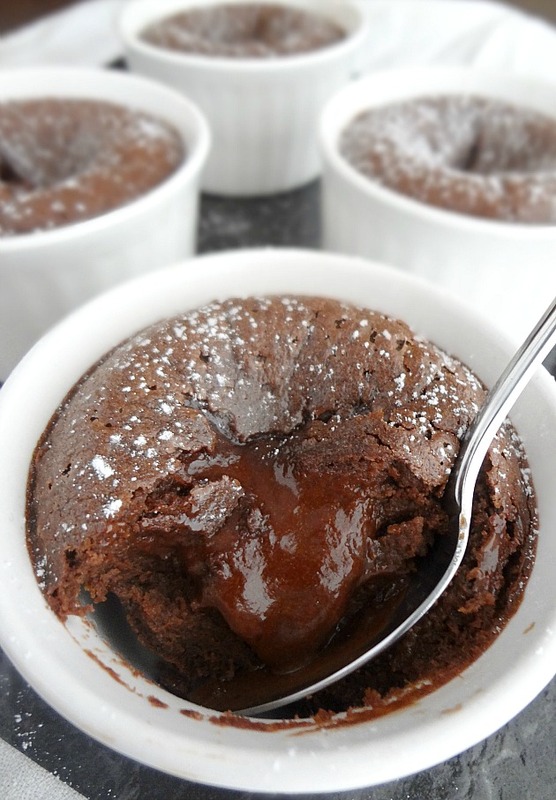 It's chocolate...it's rich....it's molten...it's the best. BUT--have you guys heard of melting chocolate cakes??? I hadn't until recently but I have got to say...I'm totally on board with the idea. 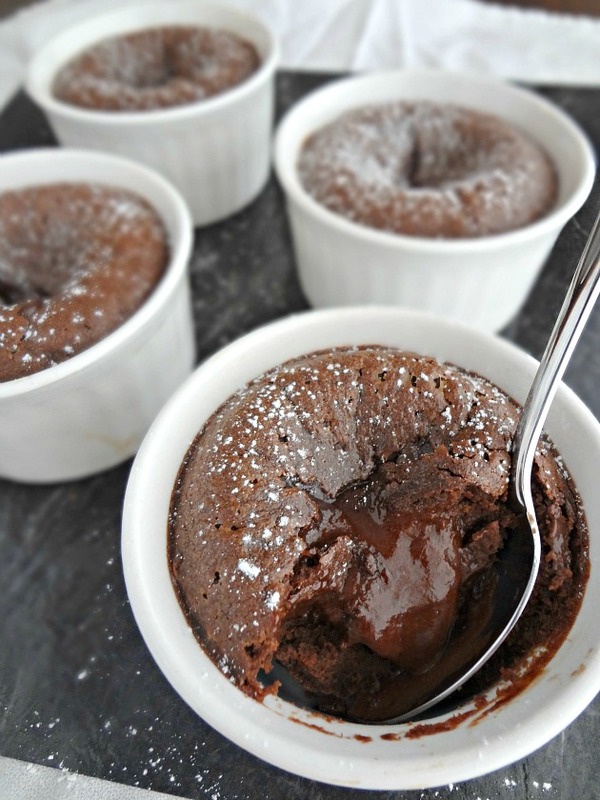 They're like lava cakes...BUT WITH MORE LAVA! It's just a lot of gooey chocolatey goodness. Like...to the point where you HAVE to serve them in their ramekins because they're too gooey to plate. You just dig in. Which sounds like heaven to me! I ate 3 within the first day of making them. I wanted to eat the last one...but I decided to inform Michael that I made them and give him the opportunity to have one. He said we could share the last one and eat it together. Summary--my husband is much nicer than I am. They're perfect. 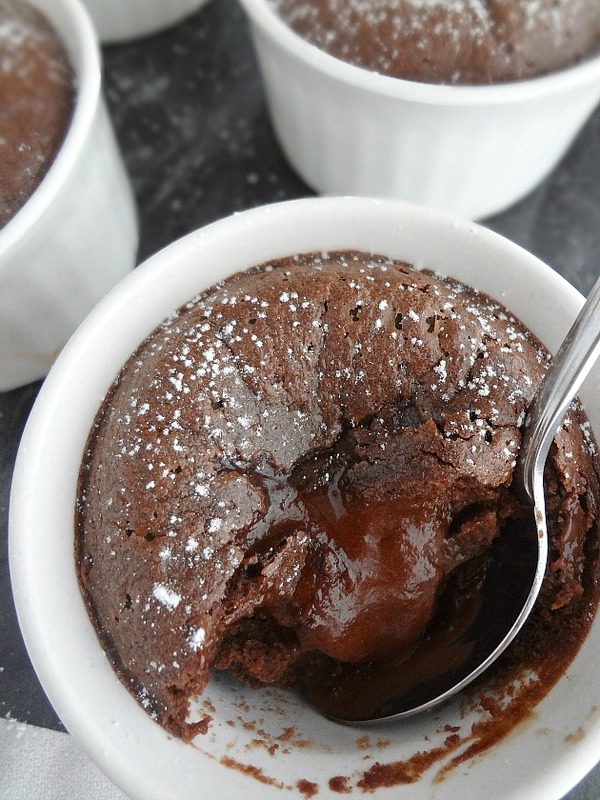 They're the best amount of chocolatey, and the melting chocolate centers are everything. Definitely one of my favorites. 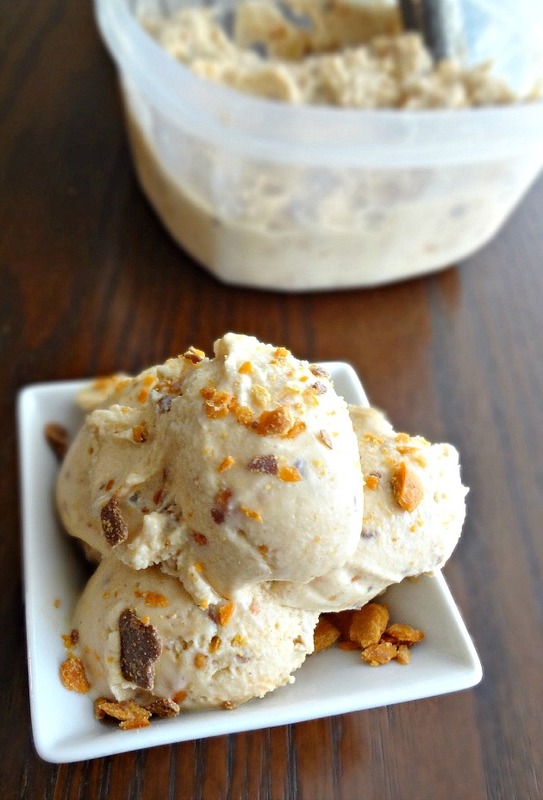 And, whether you're going on a first date or begrudgingly sharing with your husband, I suggest you make them. Work last weekend went super well-I was able to work with 2 girls I was already friends with and we were stationed at the "Kids Zone" so we just hung out and helped 2-6 year olds ride these little strider bikes, it was pretty great actually! And the rest of this week I just got stuff done and worked. And I'm working this weekend. So....pretty boring stuff. 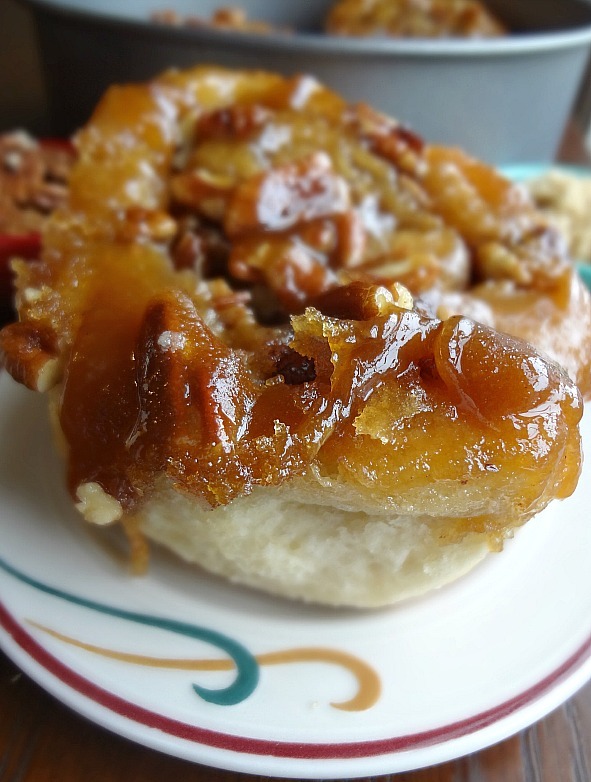 If you're looking for some recipe ideas for the 'ole SB, check out this post! I'm an Italian gal who loooves ricotta cheese. I LOVE IT! On pizza, in lasagna, even in gnocchi! My heart breaks for my poor brother-in-law and his wife: they moved to North Carolina this year (my sister-in-law, Emily, is attending grad school down there) and apparently they do not have much in the way of Italian food. Like...they don't carry ricotta in normal grocery stores. WHAT THE WHAT??! That's insane. And sad. I'm sure they both load up on the Italian food when they visit, though, but still...that'd be a tough one for me. 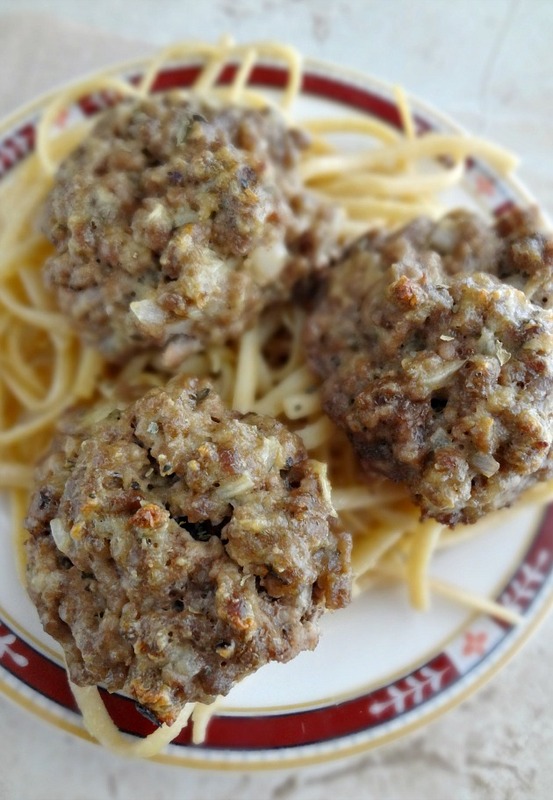 Soooo...when I saw the idea of putting ricotta in meatballs. Clearly, I was gonna have to try it. And I'm so glad I did! It's not like a totally revolutionary thing-it didn't make meatballs all of a sudden taste totally different! Buuuut...I definitely think it added a little extra somethin' to them, and they were super moist. Which I think is probably due to the ricotta? Regardless, I like 'em. You'll probably like 'em and....if you live in the South and have a hard time finding ricotta....oh man. I'm so sorry. Someone needs to like...write a letter about this. Because it's a real problem. 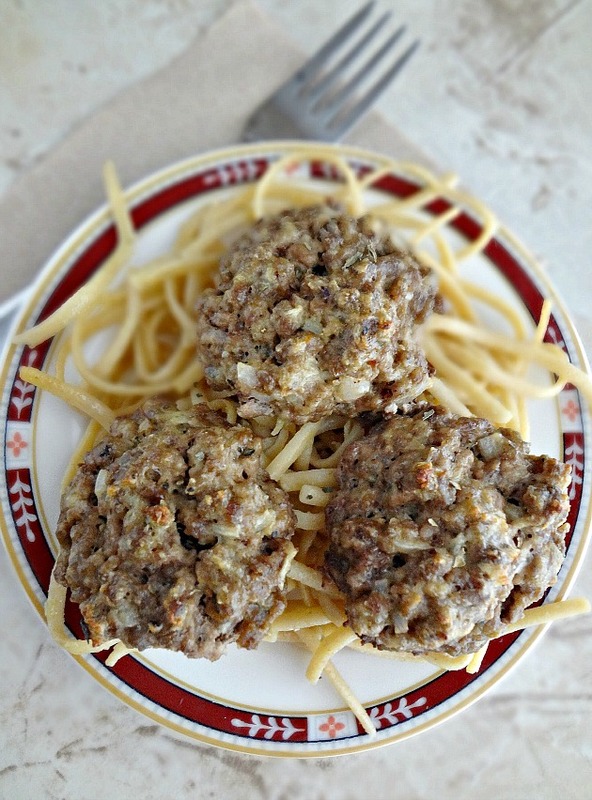 Or you could just make this meatball recipe. But I still recommend you try this one.